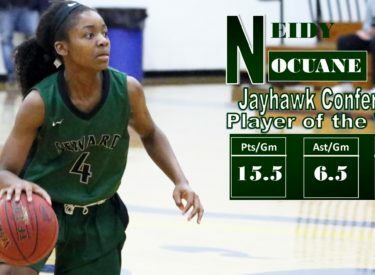 Leading the 6th ranked Seward County Lady Saints to a pair of wins over the holiday break in Pensacola, Florida, Seward point guard Neidy Ocuane has been named the Jayhawk Conference Player of the Week for the first time in her career in a league release on Wednesday. Sophomore Neidy Ocuane helped the Lady Saints start the second half where they finished off the first last week in Pensacola, Florida, leading Seward to a pair of wins, including a victory over #4 Shelton State on Thursday. Ocuane averaged 15.5 points and 6.5 assists per game offensively and also picked off 4.5 steals per game on the defensive end. She flirted with a triple-double in Seward’s win over Patrick Henry with 14 points, 8 assists, and 6 steals in just 17 minutes of action and backed that up with a career high 17 point performance in a victory over the 4th ranked Buccaneers. Ocuane becomes the third different Lady Saint to win the award this season, joining teammates Joanna Grymek and Mollie Mounsey who received their awards in week three and week five respectively. No other Jayhawk Conference team has won the award more than once this season. Ocuane and the Lady Saints are currently 14-0 on the year and 10-0 in Jayhawk Conference play and will take the court again on Saturday at home in the Greenhouse when they host the Colby Trojans in a 6:00 tip.